Vinoyo.com - An online wine community for African Americans, people of color, and people who love wine! Wine from Maui, how bad could it be? …let me count the ways. I recently returned from a long overdue vacation in Maui. It was my 5th trip to Hawaii and my third time in Maui. Sand-and-sun are not my thing, but overall it was a great family vacation. On most of my travels, I bring a few bottles of wine. On this trip I bought two bottles of wine and one sake. I always think it is a good idea to travel with bottles of wine or sake, either for personal consumption or to give away as gifts. On this trip I bought an excellent 2006 Conundrum White Table Wine, a good bottle of 2006 Vision Cellars riesling, and a very good sake. I highly recommend the 2006 Conundrum. It’s a multi-varietal white wine from Napa, made in cojunction with Caymus. It’s inexpensive (~$20), refreshing, and unique. Conundrum will not improve with age. I would drink Conundrum within 6 months of purchase. I almost always bring a bottle of sake when I travel, except of course when I journey to Japan. Sake travels better than most wines, will not lose its flavor profile if kept cold for several days, and it’s difficult to find good sake on the road. For my trip to Maui, I brought a very good bottle of Masumi Okuden Kantsukuri, the “Mirror of Truth.” This post, however, is not about what I bought to Maui, but about a winery in Maui. How much should you pay for a good bottle of Cabernet? Simple answer: “no more than you can afford”. So if your budget for Cabernet is $9.99, look real hard and you can probably find a descent one. Hopefully this not “where you are at”! More complicated answer: You can afford to pay more but don’t want to pay more than you ought to. How much should you pay? Suppose you want to collect higher end Cabernets but want to shop for bargains how much should you pay? . The two top producers of Cabernet based wines (in terms of volume and quality) come from Bordeaux (France) and California (Napa & Sonoma). In an attempt to answer the more complicated question, I created the “Roach Curve” (see Table 1 and Figure 1). I took all the wines on the Wine Spectator website and sorted them by score and price and placed them into groups. I then found the median price of each wine. For those of you who don’t remember (never knew or forgot) the median price simply means, one-half of the wines cost more than the median price and one-half will cost less. For example, if there are five wines costing $12, $15, $20, $35 and $1500, the median is $20. In contrast the average or mean price would be $315. Obviously $20 is more representative of a type price of these wines. The beauty of this approach is that you usually do not calculate the median, you simply sort by price within a score range, count the number of scores (4th column of Table 1 and take the middle value). If there are an even number of prices, take a value mid way between the two middle prices and you have it! Figure 1 graphically displays the data from Table 1. Admittedly this is less than a perfect approach because the ranges are relatively wide. For example, 90 points is not as prestigious as 94 points. The argument I would use however is that “if a wine is near the top of the rating range (e.g. 94 points), and it is priced is well below median (or at the bottom of the range), then from a price standpoint it is a good buy compared to other Cabernet based wines”. Even if the score is not at the top of the range this information can be useful. For example, take 95-100 point cabernets, the median price is $125, range is $65 to $350 (see Table 1). A 95 point Cabernet for a $65 is probably a good purchase. Buy one bottle and taste it. You may want to purchase a large quantity because if the rating is accurate it is likely that it will keep for a long time and prices for Cabernets keep going up! 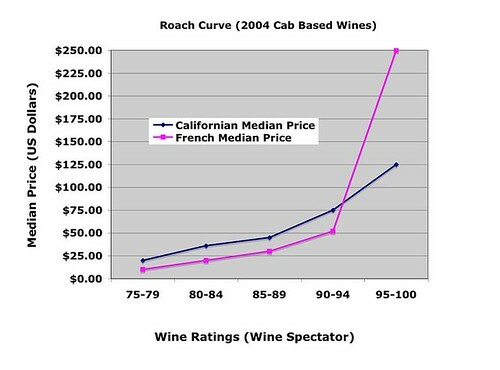 In addition, what’s also interesting from this type of analysis is that the median price of California wine rated by Wine Spectator are slightly higher than French wines which are 95 points and below. However, the high-end French wines are significantly more expensive than California wine (as is shown at the right portion of Figure1). A similar analysis can be performed for all the types of wines the readers may wish to consider purchasing! Stay Tuned for more “Roach Clips”! I’ll travel to a wine region ( and dedicate all the time and interactions) to the local wine- Champagne. I’ll seek out two kinds of grape that I’ll understand more thoroughly than before,( Chenin Blanc and Grenache Blanc). I seek out and find a good “go to” wine either white or red for under $20.00 dollars retail. I’ll find a book or publication and stay tuned to its food and wine page and stay current with what’s going on in the food and wine world. Please let me know what your new year’s wine resolutions are. It’d be good to compare and discuss. i look forward to your comments. Next week I’ll share the 24 ideas that I had to start with. In early December ’07, I returned from a two week trip to Japan. It was my fourth trip to Japan in the past 6 years. I went to Osaka to visit my in-laws and to spend some time in, what is now, one of my favorite palces to travel. On this trip, I primarily stayed in Okasa, but made excursions to Koyasan and Kyoto. This was my fouth trip to Japan in 6 years. 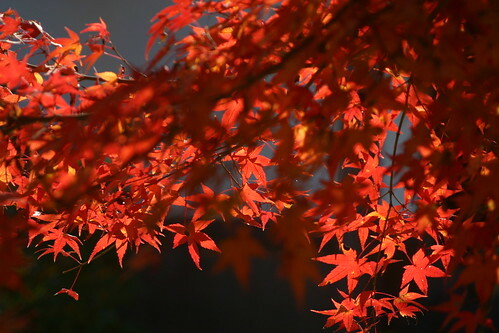 Over the course of these excursions, I have traveled from Fukuoka to Tyoko, and many points in between. I never thought that I would enjoy Japan, but I now love being there. As a matter of fact, I previously had no interest in re-visiting Asia. I have done my share of globetrotting, mostly in Europe and Africa. My only trip to Asia was a week long journey to Singapore and Maylasia about 15 years ago, and although I had a good time, I was not impressed enough to return to Asia. Through the fateful, and fortunate, accident of marriage, Japan has become my favorite place to journey. When the weather turns to this wintery, below 60 degrees, there are a few specific wines that I think about! Along with that, a few season specific foods that come to mind. In my kitchen, this is the time to indulge in hearty foods, hearty vegetables, carrots, turnips, squash/ pumpkins and of course MUSHROOMS!!!!!!! Pastas, especially stuffed pastas ( ravioli, tortellini, etc) risottos and ragouts, cassoulets which implies beans, sausages and confits of meat ie: duck, pork, quail, squab and I could go on for a while still. I get very excited to link food and wine. #1. Wine rules are made to be broken. For example, it’s commonly believed that white wine goes with fish, or white sauces and red wine goes with meat. There are times when the opposite may be optimal. #2. Always taste wine before buying – unless you are: (a) familiar with the wine critic who rated it and consistently agree with his (her) palate; and (b) it is too expensive to buy a bottle to “simply taste”, particularly when it is a wine that tends to need aging to be at it’s best. #3. Don’t collect wine unless you have a place to keep it. Wine should not be allowed to exceed 68 degrees. When wine is stored improperly it ages faster and may turn into vinegar. #4. If you are going to collect, collect no more than 10% of your capacity per year. Your taste will change and different types of buying opportunities will arise. For example, you don’t want to fill your cellar with California Cabernets only to find out years later that you prefer Italian wines but don’t have the money or space to have both. #5. Blind tastings are essential to keep you from fooling yourself. Ultimately it comes down to this, if your tastes don’t match the critics, why buy wine you don’t like? #6. Learn to pair food with wine. Consider the spices in cooking and if the wine will compliment it. We found that we prefer barbequed meats with Zins and Syrahs instead of Cabs. It is terrible to pair great food and great wine that clash. Mediocre wine can taste excellent when ideally matched. It takes practice but generally light wine goes best with light foods. #7. Don’t believe the hype. Buy what you like to drink. This rule relates to Rules # 2 & 5 above but also extends to determining how much more you should pay for wine. #8. Be aggressive about purchasing good highly rated wine you really like. Pay attention to the Roach curve or create your own rules (see Roach Clip next month). Great value, great tasting wines tend to go fast and years later you will wish you had bought more before the price went up. #9. Don’t get stuck in a niche. Try and buy a variety of wine. Don’t be afraid to taste wines from over the world. #10. Read about wine. The most popular sources are Wine Spectator, Wine Enthusiast, Wine Advocate, Tanzer, but if you don’t have time read “Roach Clips”! I knew I would would not like it. I actually knew I would hate it, but I bought it anyway. Why did I but this bottle of wine? I bought this bottle to give it a second chance. I bought this bottle to blog my displeasure. I bought this bottle to give my myself something to complain about. Something to take my mind off politics and the war in Iraq. 2007 Beaujolais Nouveau. Any year Beaujolais Nouveau (BN)…I don’t care, this stuff is absolutely horrible. Some say it’s tradition. I call it a waste of precious hepatocytes. Send this vino to St. Elsewhere. I’m not even going to describe how bad this stuff actually is…I would not even call it wine. I was going to dissertate on BN. I truely want to inform people about wine and the wine culture, but I’m not going to waste my time on this one. Look it up on Wikipedia if you want to learn more about BN. Our un-official motto is “we try the bad wines, so you don’t have to” I’m going to consider changing the motto. Stay tuned, however, there are better days ahead. 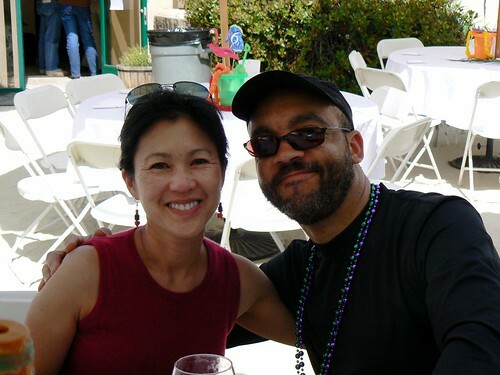 Look for contributions from Anani and Mack. We hope to have some videos soon (vinocasts). My wines of the year! Thanksgiving vino picks! And a little something from Japan! I had a dinner meeting with the folks involved with this website, Mack, Anani, and Michaelangelo. We discussed multiple issues in regard to the direction of the site…but more on that later. A reader, Jonathan Branch, sent me a bottle of his Branch Cellars, Animae, 2005 Cabernet Sauvignon. It was well received by the fellas. This is a quick note while the flavors linger. I decanted this wine at room temperature. Beautiful, transparent ruby color. Upon opening, the nose is young, but suprisingly full. It has a distinctive cab aroma, surprising for such a young wine. Good fruit. Moderate acidity, and very strong tannins. We let the wine decant over two hours. The dark fruit flavors have come out to play. Persistent strong, but now textured (layered) tannins. The balance is asserting itself. The finish is very long. Impressively long. Back to the fence long. Bordeaux long. It’s young, as expected, but this sucker has legs. Would hold for a minimum of three years. A standout now, but will really improve over time. I am (insert pause for a sip) impressed.